Strength. Empowerment. 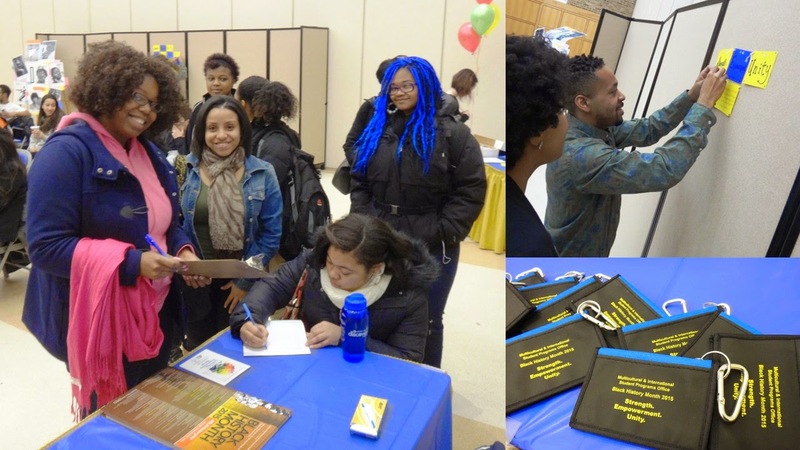 Unity was the theme for this year’s Black History Month and that message definitely flowed through the whole Black History Month Reception that was held yesterday. The Multipurpose Room was filled with music and references to the Black cultural experience in the U.S. There were art pieces, images of Black icons—ranging from James Baldwin to ballerina Misty Copland—and a table for guests to sign and attach their thoughts to a broader quilt that covered the theme of the month. The program opened with the MC, Mikwaevonn Mills, introducing and explaining the theme and its cultural relevance to the audience. She then introduced the Hofstra’s Gospel Ensemble, who led the audience in singing the Black National Anthem, “Lift Every Voice.” After the gospel ensemble, Ms. Mills then introduced our wonderful speaker for the occasion, Dr. Gloria Browne-Marshall. Dr. Browne-Marshall expounded on the theme, breaking down the current generation’s need for Strength, empowerment, and unity. She called the students “the next great generation” and urged them to remember the sacrifices of the past protesters and leaders. The audience sat engaged as Dr. Browne-Marshall flowed in and out of the past historical movements, previous legislation and tied everything into the current climate of protest and youth engagement. She ended her speech with letting everyone know, the new and the older generations, that everyone has a place in the process for change and that everyone has the responsibility to strengthen, empower, and to unite each other. After the speech, Gloria Browne-Marshall then took questions from the audience. Students, staff, and community members asked questions that were eloquently answered by Dr. Browne-Marshall. Visit the MISPO website to find out more about other Black History Month events.